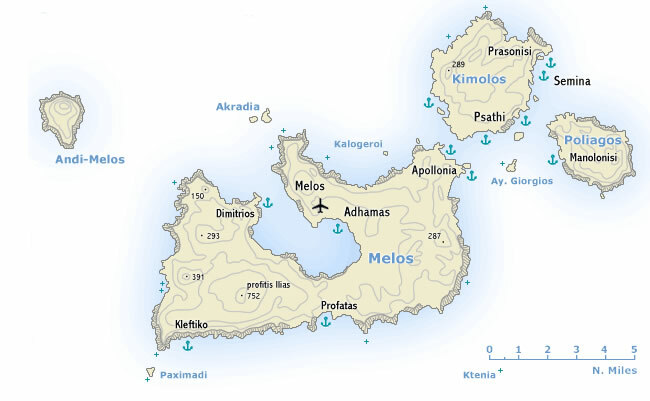 The island of Melos - Milos - Μήλος, the most westerly of the larger Cyclades, owes its distinctive topography and the pattern of its economy to its origin as the caldera of a volcano of the Pliocene period, to which the sulphurous hot springs in the north-east and south-east of the island still bear witness. It has one of the best harbours in the Mediterranean, formed when the sea broke into the crater through a gap on its north-west side. The north-eastern half of the island is flatter and more fertile than the upland region in the south-west, which rises to 752 m in Mount Profitis Ilias. The island’s principal sources of income – besides the tourists either on a sailing holiday or island hopping by ferry – are its rich mineral resources, including pumice, alum, sulphur and clay. Kimolos - Κίμωλος is an arid and inhospitable island of volcanic origin lying, which was known in antiquity for its terra kimolia (cimolith), used both as a detergent and in medical baths.